22 years it’s taken me! Once upon a time, soon after I had restarted hill-walking (after a 12 year lay-off), a couple of my mates mentioned going up this big hill in Perthshire. “Shee-hallion” they said. It was July 1989, I was 30 and was about to get bitten by a bug which remains with me to this day. On climbing the hill, they told me that it belonged to a group of hills called the Munros – named after some chap or other and all at over 3,000 feet. Being the inquisitive type, I did a bit of research (this was pre-Google) and found out that there were 277 of these hills and they ranged over a fair bit of Scotland. My girlfriend of the time was also into hill-walking and we soon started to strike out for other hills, armed with a copy of the SMC guide and whatever OS map was appropriate. Slowly, the gear got better (and more colourful) and the ambitions increased. We’d set off for weekends and weeks together, tying up Munro ascents with some camping. 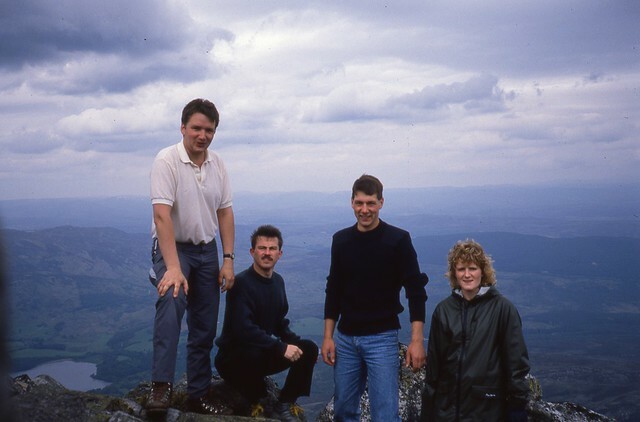 On the weekends she was working, I’d head off myself or perhaps with the Bank of Scotland Hillwalking Club. I started to note down the ones I’d climbed but never really thinking I’d actually get to the stage of doing them all. My lack of a head for heights ruled out such epics as the Skye Cuillin or the Aonach Eagach. And then, approaching 200 or so, my daughter appeared on the scene, other interests came along and the hill-walking faded into the background. Fast forward a couple of years and as my daughter grew into a small child, I began to harbour a notion of getting back outdoors regularly again. A brief spell as a Voluntary Ranger in a local Regional Park got me known at work as an outdoors person and when this guy at work, Paul, asked me about how he could get to photograph a cloud inversion, I found myself lending an experienced hand to a couple of hill-walking newbies. That started a whole new series of adventures, many of which would now be going for some very ambitious long outings or using Davids head-for-heights to give me the confidence to try things I thought I never would. Slowly, the list of Munros I’d still to climb was shrinking. Meeting the TV guys in Portree, we had a brief chat then headed off to the bedroom for some filming. The focus of the documentary was to be on the preparations, so we had a chat about routes, weather forecasts and gear, before I laid out all that I’d be carrying and did a quick explanation of each item. Filming over for the night, we headed off for food and a couple of leg-relaxing drinks. Saturday morning’s alarm went off to a damp, drizzly Portree, with a haze of high cloud over the Cuillin. A hearty breakfast, a quick sandwich from Scotmid and we bundled ourselves into the car for the short drive. 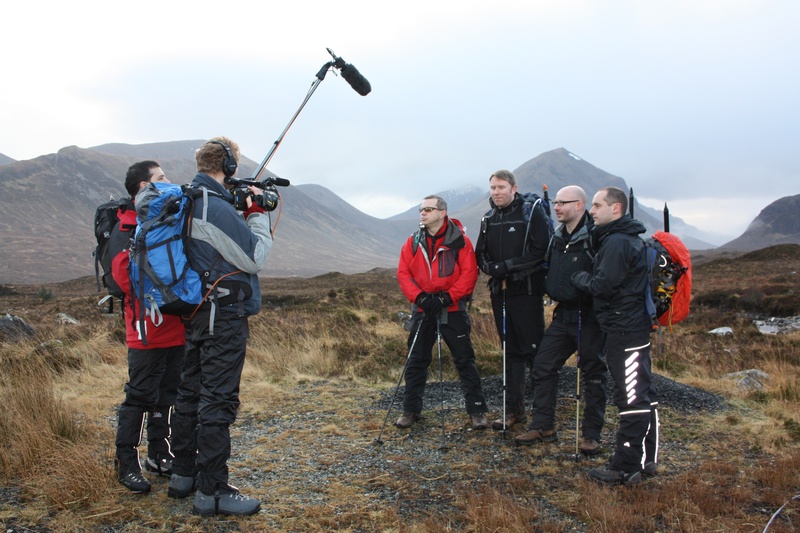 Again, the film crew watched as we did all the last minute preparations before finally getting under way on the path towards Glen Brittle. Trying not to ruin our rhythm, Iain would run ahead with the camera, film us walking past, then pack up, just to repeat it all later. It was like walking with a young dog! As the path rose over the moors, we cleared the intervening ridge and were awarded with a clear view of the walk ahead, with a little cloud washing over the summit. The route looked fairly straightforward, climbing a steepening bank of snow towards the lowest part of the ridge. Before long, the snow was getting firmer, but we felt secure enough to let Iain and the crew lead the way up to the ridge in order to film us reaching it. Once on the ridge, it became clear that the normal “walkers” route was under some very steep snow. David and I agreed on a route which would take us onto a rocky intervening ridge, but the traverse across to the ridge involved a very steep, bare rockface and when we looked behind us, an animated discussion was going on, with some of the group not liking this option. Eventually, we opted to don the crampons and traverse across the top of the snow slope – following what would have been the line of the path. Despite one scary slip by Iain, this turned out to be fairly straightforward and we were soon on the final rise. One more ”walk-by” and the summit and trig point were in sight . It was about now that I began to get frustrated by the lack of progress, with discussions of camera angles and such going on. All I had to do was push a couple of folk out of the way and I could run across...... However, I bit my lip and waited until everything was lined up before making those last few strides. Finally, then, here I was. Had I been on my own, I might have knelt and offered up a little prayer to the mountain deities. As it was, it was out with the champers (Cava actually) that Ross had carried up. The cork, I will admit, now litters the corrie below. However, the contents were shared out and passed around – the most unusual drink I’ve ever had on a mountain summit. The Balvenie Doublewood which followed was also appreciated; its dark warmth a contrast to the day at hand and the Cava. A bit more filming and it was almost time to go back. I did manage a few short minutes of more quiet reflection. Thinking of others who’d accompanied me on my journeys, of the very best times, some of the worst and then of my parents who had introduced me to the outdoors as a child. They might never have understood my desire to climb these hills – especially given I hate heights – but I'm sure they’d have been proud of me. 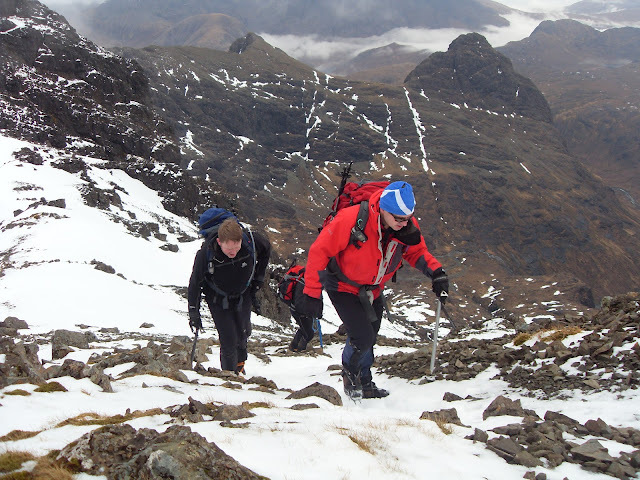 All that remained was to get down the hill safely – initially using a snowy runnel we’d considered for the ascent. 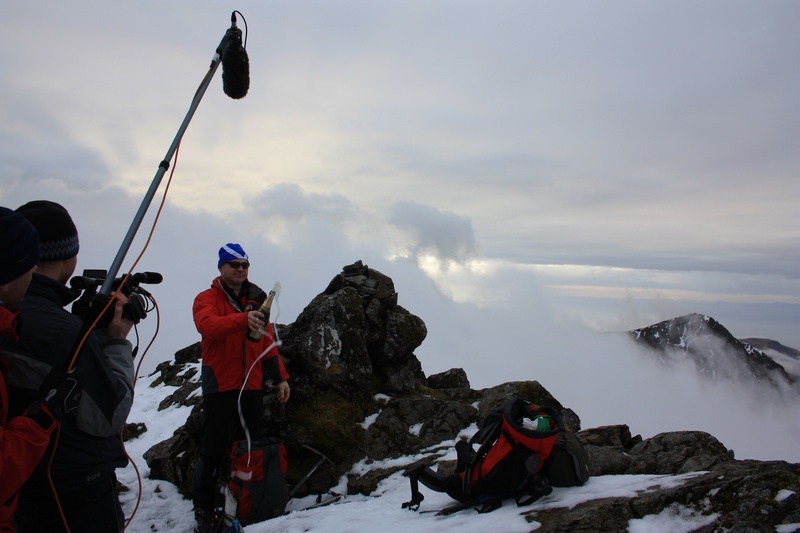 We even let the TV guys have a shot at ice-axe arrest once the slope and terrain made it safe enough. The walk back in the gloaming was relaxed and easy, with thoughts running ahead to a warm shower, a few more celebratory drinks and a venison curry in Portree. Of such things are memories made and friendships enhanced. Has my stride increased now I’m a compleater?? ?